(Nanowerk News) This year’s RoboCup, the world championship series for intelligent robots, will be held from 26 - 30 June in Eindhoven (the Netherlands). The competition expects around 2500 contestants from around 40 countries, competing with their rescue robots, service robots, dancing robots and of course soccer robots. Teams from the USA, Germany, Thailand, Japan, Iran and the Netherlands will defend their world titles which they won in 2012 in Mexico City. The aim of RoboCup is to speed the development of reliable, low-cost robot technology to serve our ageing society. The RoboCup series features several robot soccer leagues. There are three leagues for ‘humanoids’, walking robots with arms and legs. And there’s the Middle Size League, in which the most spectacular soccer is played. Eindhoven University of Technology (TU/e) is the current world champion in this ‘premier league’. The matches are played by teams of five table-height soccer robots, playing completely autonomously and without any kind of human control. The game is fast, tactical and exciting to watch. There are also ‘Simulation Leagues’ (in which computers play against each other in a virtual world), and there’s the Standard Platform League, in which all participants use the same robots (NAOs). In this league it’s the programming of the robots that makes the difference. In the [email protected] competition, service robots compete against each other in carrying out everyday household tasks, such as taking spoken orders for drinks and then serving them at the right place. To do this, the robots must be able to understand, recognize and follow people, and they have to be able to pick up the right drink from among many other objects. The RoboCup Rescue League is all about saving people in disaster situations. These robots must be able to locate victims in a simulated disaster area and find out how badly injured they are, while at the same time checking the surrounding area and buildings and then reporting on their findings. Robots of this kind are urgently needed in disaster situations, such as the accident at the Fukushima nuclear power plant. The aim of RoboCup is to speed the development of robot technology to serve our ageing population. RoboCup has set itself a goal: by 2050 a team of soccer robots must be able to beat the human world champions. The technology is advancing rapidly because the participating researchers share all their new knowledge with each other the day after the competition. The contestants in RoboCup 2013 come from countries around the world, including Brazil, China, the USA, Canada, Germany, Mexico, Spain, Portugal, the Netherlands, South Korea, Italy, Austria, Thailand, Indonesia, Iran, Australia, Japan, the UK, Pakistan, Macau, Singapore, Sweden, France, Croatia, Israel, Slovenia, Taiwan, Romania, Switzerland, Colombia, Chile and India. The countries with teams defending world titles can be found on the RoboCup 2012 website at: www.robocup2012.org/competitionsResults. As well as the ‘Major Leagues’ described above, which are mainly contested by university teams, there are also Junior competitions for high school students, with more than 1000 participants from countries worldwide. Next to the competitions, RoboCup also features a range of other entertaining events. For example there are all kinds of robot workshops and demonstrations, including ‘cuddly’ dinosaur robots for small children, music robots and research robots. That means RoboCup is a great opportunity to check all the latest robot developments and ideas. You can follow the competition on the RoboCup 2013 website at www.robocup2013.org, on Facebook (www.facebook.com/RoboCup2013), Twitter (www.twitter.com/RoboCup2013) and on YouTube (www.youtube.com/user/RoboCup2013). 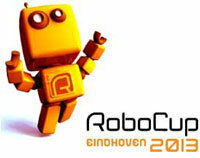 RoboCup 2013 is organized in cooperation with Eindhoven University of Technology (TU/e) together with several other universities. The main sponsors of RoboCup 2013 are TU/e, ASML, MathWorks, Eindhoven365, the City of Eindhoven, the Province of Noord Brabant, the 3TU.Federation, Aldebaran and Festo. The Brainport Eindhoven region is one of world’s smartest; it won the title Intelligent Community of the Year 2011 by the Intelligent Community Forum (ICF).